Home > Membership > Nonprofit World > Is Your Financial Information Online? 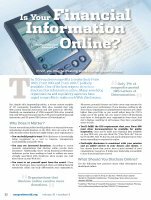 Is Your Financial Information Online? If not, you may be missing some crucial opportunities.